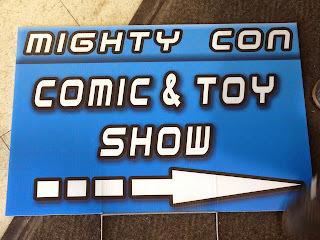 This weekend, I attended my first comic convention of 2016. It's a fairly small, local one held inside one building at the county fairgrounds. A little less than a dozen professionals were there, a couple you may have actually heard of. Mostly, though, it was retailers. 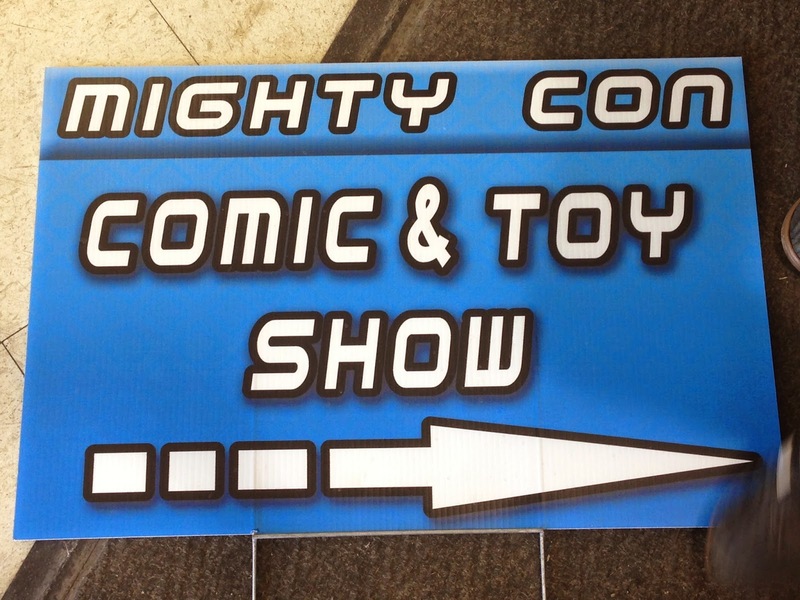 I'd guess about half were selling actual comics and half were selling toys and shirts and comics-related goods. It's only a one-day show, and I'd guess there were a few thousand people in attendance. Definitely not a big name show with a huge draw that you often see talked about on comics news sites, but a respectable, seemingly well-run endeavor for (mostly) locals. As you might expect from a convention like this, there wasn't much in the way super high-priced items. I don't think I saw any Golden Age comics at all, and the only original art I saw came from the local creators you haven't heard of yet. That's not a complaint, of course; I'm just saying it's not that type of show. But without those high ticket comics, and with the latest issues also being absent, it highlighted something in the selection I don't think I'd noticed before. Nearly every comic there was priced at under a dollar each. Rows of long boxes with a sign on the front that said, "$1 each, or 12 for $10." The largest dealer there (judging based solely on how many comics he brought to sell) had EVERYTHING marked at 50¢ each -- around 100 long boxes. Needless to say, those cheap comics weren't especially valuable. The newest ones were largely forgettable superhero books, and the oldest ones weren't in very good condition. And it looked like the dealers had (understandably) given up on bothering to keep them organized long ago. You'd find batches of one title clustered together, but it was mostly a crapshoot. I was pleasantly surprised to be able to fill in a few minor holes in my collection, and came across a couple so-bizarre-sounding-it-has-to-be-worth-a-look indie books as well. Also interesting was that hardcovers and trade paperbacks were exceptionally cheap too. Naturally, pricier than a buck a piece, but many of them were listed at half off the cover price. One guy had a sign that said all paperbacks were $5, and all hardcovers were $10, and he had 30-40 long boxes of them. What I find interesting here is that we've known for a while that the back issue market more-or-less flatlined several years ago -- the result of a combination of publishers reprinting many of their old books, and the proliferation of digital comics. That's why you see few retailers have a large back stock in their stores any more. So they're using conventions to try to unload those back issues at prices that I have to imagine are not covering their booth costs. The $65 booth fee at this particular convention is quite reasonable, I think, but that doesn't include a dealer's time and effort loading up all those long boxes, trekking out to the fairgrounds, setting up everything, dealing with customers all day, trying to squeeze in time for a crappy lunch, and then run the whole process in reverse to get home. You'd have to sell A LOT of fifty cent comics to make that worthwhile, I should think. All of which leads me to wonder... if the big dealers don't go to the local cons, and these smaller dealers get to a point where they can't justify it either, that doesn't leave a whole lot left. A handful of mid-range guys who only bring a few long boxes to try to draw people in with the hopes that one of them might buy a $250 statue? And if that's all that's left, with no real bargains or selection, do the customers bother continuing to show up? I did't expressly talk to any of the dealers at this show who were unloading cheap back issues. But I overheard a few snippets, and picked up on the tenor of their voices that they weren't happy with where things were going. The show seemed well-attended, and people seemed to be buying, so I don't think it was that they were having a bad show per se. But there seemed to be some underlying concerns about what they were going to do in the long term to try to remain viable. Most convention reporting focuses on the big shows with lots of guests. Keep an eye on these smaller ones, though, in the next year or three. I suspect there'll be some shifts that wind up being noticeable throughout the market.